We Might Have Our First Glimpse Of The New Spider-Man Costume! Is Zack Snyder’s son playing Robin in Batman v Superman? The next season of Arrow could be drawing on a famous comic book storyline. The future of the Terminator has been put in doubt following Genisys. Plus, new footage from Mission Impossible: Rogue Nation and Fantastic Four. To me, my Spoilers! Rumors circulating from Heroic Hollywood that Zac Snyder’s son Eli will play the former (and, as of the movie, deceased) Robin in a flashback scene have been boosted by an instagram picture posted yesterday of Snyder with his son, with the caption “Boy Wonder?”. The planned sequels to Terminator Genisys have been put into doubt, following the financial underperformance of the first film—with an undisclosed source from Universal telling THR the studio “will definitely need to see the holds globally to confirm that people like the film” before considering future films. They just signed me to do the fourth Toy Story. We start [work on it] in September, and I’m very delighted with that. … “When John [Lasseter] approached me for the first one, I said, ‘I don’t do comedy with cartoons, dummies and toys. Leave me alone.’ And [John] said, ‘No, you’re gonna love this!’ Then he told me the money and how nice it was going to be and, I said, ‘Yeah, I can give it a try.’ All of a sudden it’s going on 17 years. The Syndicate hunt down Ethan Hunt in a new clip. Physicist Dr. Michio Kaku introduces a series of shorts looking at the scientific reasoning behind the movie’s dimensional travel and superpowers. Here’s Charlie Hunnam lounging in a boat for Entertainment Weekly (ostensibly as King Arthur). It’s an anthology show. This is not designed to go forever. This season is meant to be standalone… I mean not as anthological as ‘True Detective.’ But not everybody will be continuing on this journey. The sort of central premise of time travel and Vandal Savage is totally up for grabs. This is meant to be a season that is tightly serialized that, when it’s over, you can’t go home again. It’s not going to begin Season 2 with us all hopping back on the same ship and like ‘Let’s get Vandal! Let’s get him for real this time!’ This is not traditional episodic television. We took the name Baron Reiter without any intention of turning him into Baron Blitzkrieg... Baron Blitzkreig is the evil Nazi super villain. Baron Reiter is not going to become Baron Blitzkreig in the show. In fact, when people meet this character, he’s not German, he’s not a Nazi, he doesn’t subscribe to any Nazi philosophies. We were attracted to an organization that actually in the comics had been associated with Deathstroke called Shadowspire. In the comics, Baron Reiter became associated with Shadowspire. Here’s two new clips from “Blame it on Leo”. 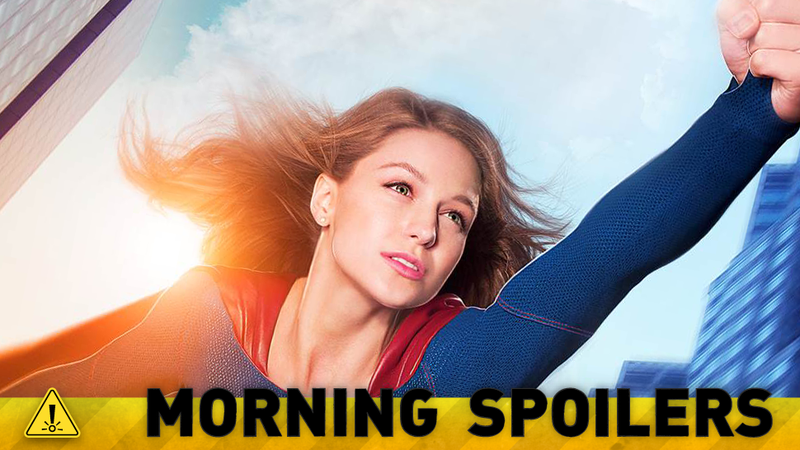 Finally, Supergirl takes flight in a new poster.